There seems to be quite a bit of photography out there showing the interiors of Chinese churches, but – so far as I’ve been able to tell – very little photography showing the interiors of Chinese mosques. 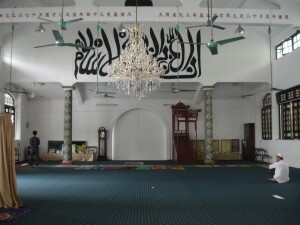 So, in pursuit of some balance, I offer the image, below, of the prayer hall at the Great Mosque in Guangzhou. It was taken in the late afternoon, the other day, just as people were beginning to arrive for the Maghrib prayer [click to enlarge]. 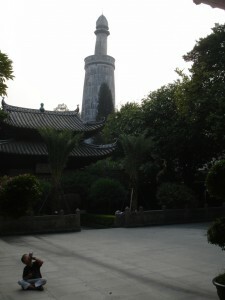 Some sources claim that the Great Mosque dates back to the first Muslim mission to China, in 630. However, according to this site – the best of the very few that I’ve been able to find – it was likely built during the Tang Dynasty (618-907) or Song Dynasty (960 – 1279). That’s a wide date range, so I’ll stick to the absolutely certain: the Great Mosque is likely the oldest mosque in China. Of course, it doesn’t take an expert in Islamic architecture to judge – on the basis of the above photo – that the prayer hall is a bit more recent. In fact, parts of it have been rebuilt several times, and the current prayer hall dates to 1935 (a 1990 photo of the prayer hall shows it in a more haggard state). 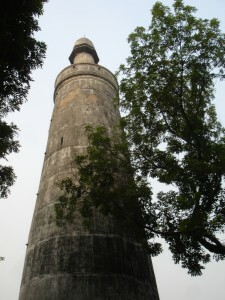 To be fair, on an architectural basis, at least, what’s most interesting and historically significant at the Mosque is the Light Tower/Minaret – rebuilt in 1350, with much earlier origins. I’ve never seen anything quite like it in China. A few photos after the jump. Further proof that the main trade artery during the Tang, Song and Yuan was not the so-called “Silk Road” but by sea from the south China coast, as it was during the Ming, Qing and of course so today. I have always been told I wasn’t allowed into the main hall of any mosques I came across in China, more as a non-Muslim than as a woman. My friend tried to argue that he had visited the interior of many mosques in Turkey and other parts of the world, to no avail. As a woman you should be allowed in without problem as long as it’s not during prayer. At that time many mosques segregate and so they’d usher you into a women’s section, though I know plenty that don’t. As for not getting in at all, that strikes me as odd. I’m a Muslim but I don’t look it and yet I’ve still managed to just walk into plenty all over the world, looking as protestant as a Methodist at Ohio Northern. I did get blocked from one in Shanghai but they never gave me a reason nor a chance to make my case. It was half under construction which may have been part of it. If you’re looking for more interior shots of Chinese mosques, check flickr. There are thousands.